This year we welcomed little Levi to our family. 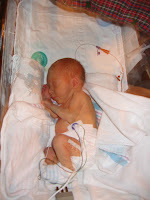 Levi arrived on May 21, 2007 at 9:20 a.m.. Two months earlier than originally planned. Here is a quick low down, everything went great until about 33 weeks. After all the tests being negative, we couldn't find any reason why I started laboring so early but here is my philosophy.....I decided to pick up an extra shift at work (I had scaled back to part time in March) My patient assignment would be light and the unit was short nurses. Well needless to say one of my patients went south soon after I arrived to work. The baby started coughing up bright red blood, hematocrit was 32 at first check, second check 15-20 min later while giving fluid boluses, the second hematocrit was 16, with blood pressure falling. The baby had some kind of internal bleeding and we didn't know why. Needless to say I transferred the baby to PICU. 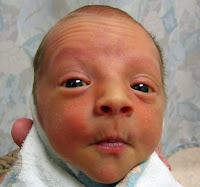 Come to find out the baby had a rather large ulcer the size of its stomach. 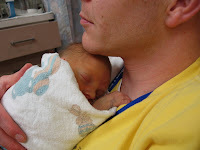 While standing at the PICU bedside giving report I started contracting and they never fully stopped until Levi arrived. I went to the hospital hoping that we could get them stopped... 2 steroid shots and 36 hrs later we had a crying baby weighing in at 4 lbs 9 oz and 19 inches long. 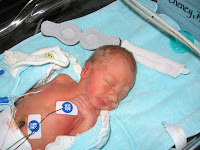 Levi did not have any complications and didn't require any oxygen. 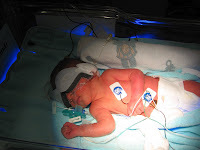 They had me deliver in the OR so that we could pass him through a window to the Neonatoligists in the NICU quickly just in case he had had any complications they could attend to him. That moment was the most terrifying moment in my life. Hearing him cry for a brief moment and seeing him being carried away. 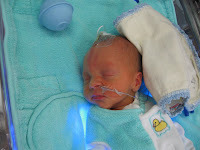 Levi stayed in the hospital for 3 weeks learning how to eat and grow. Luckily it was only three weeks, they wanted to keep him for 2 more weeks but Shane and I convinced Levi's pediatrician that we were more than qualified at taking him home (You can't get any better than having a mom as a nurse and dad as a respiratory therapist). He was eating on his own with all feeds 3 hrs apart and gaining weight WHY NOT? Within 48 hrs of being home Levi was eating better and putting on the ounces. I am blessed to have such a wonderful husband who was there for me every night that I had to come home with out my Levi. Once home, Shane was able to take a month off which I am truly thankful for. 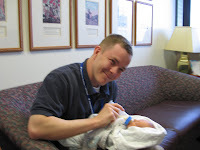 Even now Shane never hesitates to change a diaper(even if it is stinky), feed Levi a bottle, or for some one on one time so that I could catch up on some much needed sleep. Shane is a back up supervisor and a member of the life flight (fixed wing) team in the Respiratory department. He really enjoys the challenges that they all bring but still wants more. Who knows what he might be doing next! As for me I have taken on a new challenge. I am a preceptor/integrator for nursing students and new nurses on the Infant unit. Lately, I have been offered a charge nurse position but don't feel quite ready for that move so I decided to take a step out of my comfort zone of nursing and teach new nurses. I hope to teach them how to be a nurse that is an advocate, alert , and confident. Taking care of babies is so much fun. I LOVE what I do and hope that I make a difference in peoples' lives. Shane and I have truly been blessed this year. We are thankful to be surrounded by such loving and supportive family. I hope that everyone has a Merry Christmas and a Happy New Year. Loved reading the story of him coming early and glad no complications were present! mason love's the mega saucer too, it is the best investment that we have made as far as toys goes! I really loved reading that post! I loved learning more about what you and your husband do and about Levi coming into this world. I get so choked up about things like that! Must be the mother thing ;0). p.s. I had no idea how close in age Emi and Levi are! Emi was born May 4th. How funny! Rhandi, You are also awsome, you didnt seem to have it so easy either. But we are strong and thats is what gets us through. I think that it is awsome that we all can catch up on the last ten years.